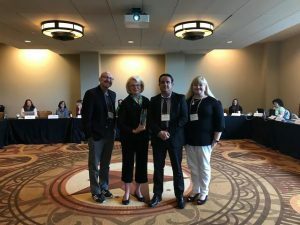 Geisler was awarded with the President’s Recognition award for outstanding leadership in journalism during the ASNE-APME News Leadership Conference. The American Society of News Editors (ASNE) honored Jill Geisler with the President’s Recognition award for outstanding leadership in journalism during the ASNE–APME News Leadership Conference this week in Austin, Texas. Geisler, the Freedom Forum Institute Fellow in Women’s Leadership and the Bill Plante Chair in Leadership and Media Integrity at Loyola University Chicago, is an internationally recognized expert on newsroom leadership and management. She is a leader of the Freedom Forum Institute’s Power Shift Project which recently launched the “Workplace Integrity” training curriculum she designed to create workplaces free of harassment, discrimination and incivility, and filled with opportunity, especially for those who have traditionally been denied it. During her 16-year tenure at the Poynter Institute, Geisler guided its leadership and management programs and helped influence the careers of countless news leaders. Today, she helps grow the next generation of journalists while teaching and coaching professionals in newsrooms from Boston to Bhutan. Geisler is also the author of the book “Work Happy: What Great Bosses Know” and writes a monthly management column for the Columbia Journalism Review. Her podcasts, “Q&A: Leadership and Integrity in the Digital Age” and “What Great Bosses Know” have had millions of downloads. In the 1970s, she became one of the first women TV news directors in the United States. “Jill advances the field of journalism every day in her efforts to support news leaders. She continues to serve as a renowned leader in the press industry, conducting leadership training and coaching in newsrooms around the world. We are grateful to have Jill guiding the important work we do at the Power Shift Project,” said Cathy Trost, executive director and senior vice president of the Freedom Forum Institute. This entry was posted in News and tagged Power Shift Project by Freedom Forum Institute. Bookmark the permalink.